At some point, every piano parent will have to wrestle their children out the door when it’s time to go to piano lessons. And when this happens, many piano parents will all be thinking the same things: Why doesn’t she want to go? Is forcing her out the door turning music into a bad experience? Should I let her quit or should I tough it out? As piano teachers, we do not want our parents asking themselves these questions because they arise from the assumption that piano lessons are the problem. In reality, however, piano lessons are rarely the reason for a student’s reluctance to get in the car and head to the studio. 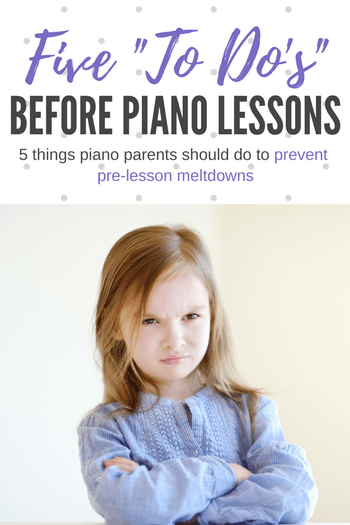 So, to keep your studio growing strong and to make sure piano lessons don’t take the blame for what’s really going on, today we’re sharing five things piano parents should do before bringing children to lessons. Are you looking for more problem-solving information to share with piano parents? If so, check out these past posts below. And, if you are looking for amazing resources that will take your lesson from “okay” to “Oh WOW!”, check out Teach Piano Today’s PianoBookClub and PianoGameClub.